Great food abounds in DC and resources about where to find it are plentiful. I almost always refer to the professional critics before I dine somewhere, just to give myself a baseline. Blogs and websites also offer opinions on nearly every venue in town. But in the end, when I’m writing a post about a restaurant, obviously I have to base it on my own experience- taking into account the thoughts expressed by my dining partners. I go to The Source lounge with two friends for a weeknight dinner. I arrive first, in time to conduct a serious review of our options. They are sufficient, considering I am dining with two pescaterians, one who eats shellfish but no dairy, and one who doesn’t eat shellfish. I always peruse the menu online prior to visiting a restaurant and look for information about specific dishes, but you never can be certain about the reliability of online menus. This time the internet is a reliable source. (see how I worked that in there). 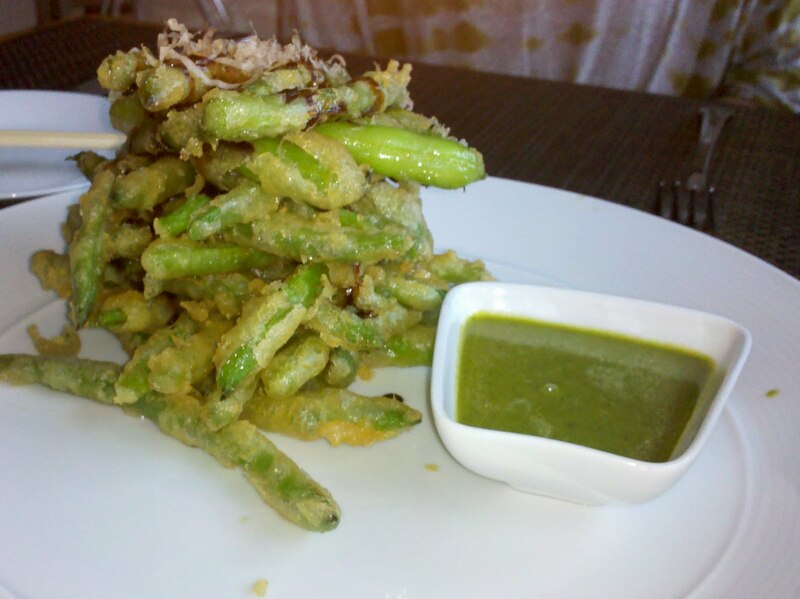 We begin with tempura green beans with a pickled ginger vinaigrette. They are lightly fried and crispy and the sauce is sweet and tangy. It’s a perfectly sized portion for three to share. These are very nicely done (particularly when I compare it to a similar dish I have at Proof a few days later which is not nearly as good). Two of us share lobster and scallop spring rolls. The presentation is beautiful. I like the crispy, salty outside and the sauce is once again sweet with a little tang. My friend doesn’t particularly like this dish. I am not blown away but I can’t find fault with it either. 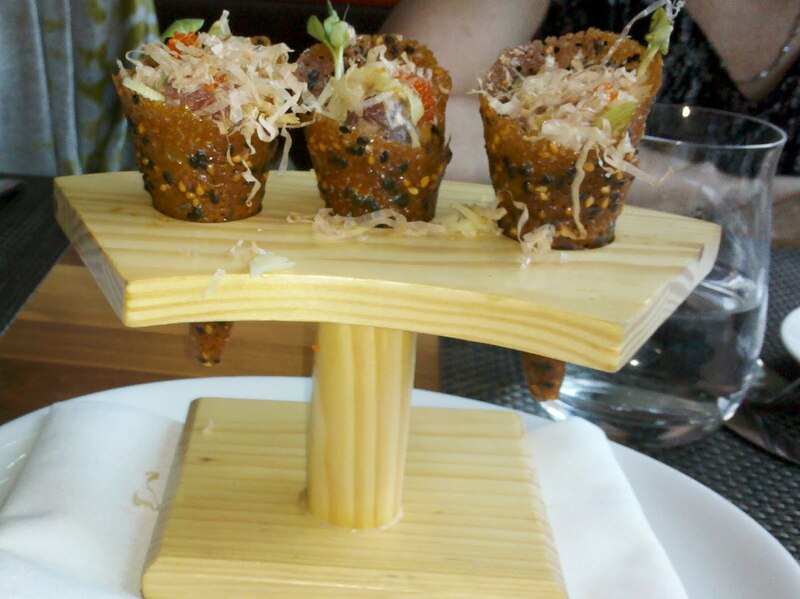 Next we have spicy tuna tartare in a sesame miso roll. I had this last year as an appetizer and really enjoyed it. I appreciate that they give us the option to order three pieces. 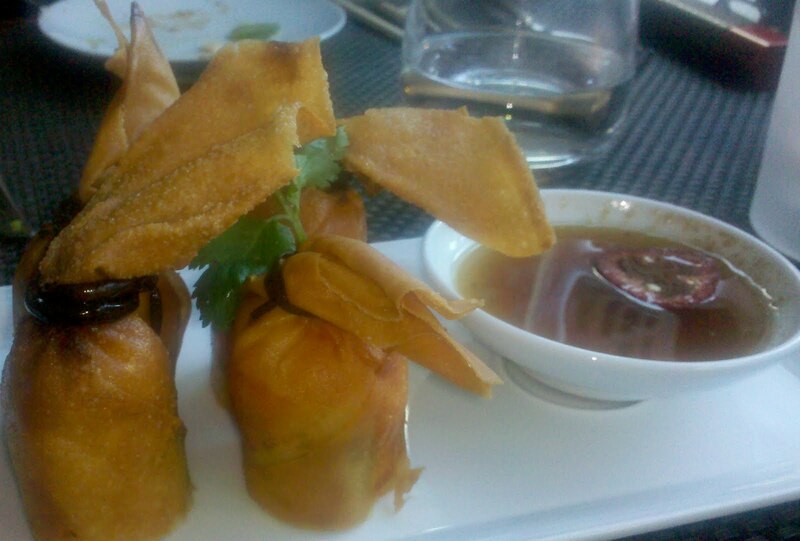 My favorite thing about this dish is the rolls themselves which are crunchy and sweet. This is a really nice contrast to the raw tuna. 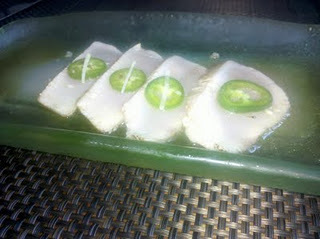 My friends share yellowtail sashimi with pickled jalapeño and citrus ponzusashimi. I am not a sashimi fan so I just have a taste. I find it okay but this isn’t my thing. My friends like it but say it’s nothing special. 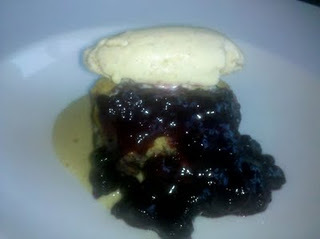 I think about trying one more dish but instead we opt for dessert- warm blueberry crumble with salted streusel and vanilla ice cream. The ice cream is smooth and creamy. The crumble tastes like a biscuit. I like my desserts with a little more sugar. My own summary presents a dilemma. I like the food. I like it very much. But something about the experience as a whole isn’t wowing me. And, I want to be wowed at such a top-rated venue. My friends aren’t any more enthusiastic than I am, so it’s not just me. If you’re looking for a fun and satisfying evening out with friends, I’m happy to recommend the lounge at the Source. But if you’re looking for a rave review, you’ll just have to try a different source. This looks amazing. I have always wanted to go the Source too. Hopefully I'll make the trip soon (along with MiniBar). I started my own food blog, HungryinDC.com, for restaurants in DC. Check it out!